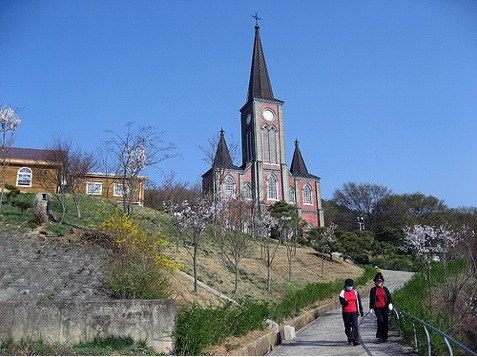 Built in 1930, this is one of the most beautiful Catholic churches in Korea. A major pilgrimage site. 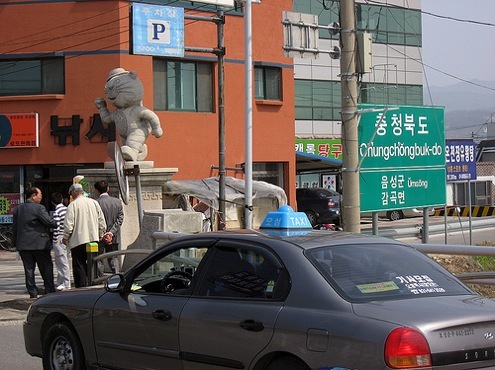 From Anseong, we (i.e., Andy Jackson and I) got on a bus to Janghowon in nearby Icheon-si. And from Janghowon, we walked across the river to its sister city, Gamgok-myeon, Eumseong-gun in lovely Chungcheongbuk-do. Gamgok-myeon is home to one of Korea’s oldest—and certainly one of its most beautiful—Catholic churches, Gamgok Parish Church, or more precisely, Gamgok Maegoe Virgin Mary Catholic Cathedral (maegoe is the Sino-Korean word for the Rosary, so I guess the proper way to translate the name of the church—the English name of the official site not withstanding—would be Gamgok Our Lady of the Rosary Church). Gamgok Parish Church sits atop a hill overlooking the town of Gamgok like a sentinel. 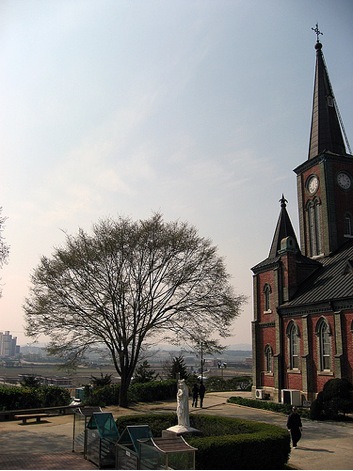 The land where the church is now used to be the owned by Min Eung-sik, a second cousin of Empress Myeongseong and a major late Joseon-era conservative. During the Mutiny of 1882, when old-guard military units rebelled against the government’s military modernization plans, Min offered the empress sanctuary at his palatial home. After Empress Myeongseong’s assassination in 1895, Min was arrested and brought to Seoul. His home was occupied by loyalist militias, which made it a target of the Japanese Army, which proceeded to burn it down. The upside to this was that when French priest Father Camillus Bouillon of the Paris Foreign Missions Society came around looking for a place to build a church, he could buy the land for a song. Or a Gregorian chant, as the case may be. It’s said that when Bouillon first saw the massive house (presumably before the Japanese torched it) and the hillside on which it rested, he prayed that if the Virgin Mary were to give him the house and hill, he would become her humble servant, and she would be the patron saint of the church. Well, as it would turn out, the Blessed Virgin Mary held up her end of the bargain (and even got the Imperial Japanese Army to foot the cleanup bill), so Bouillon kept his, establishing a church in May 1896 and dedicating it to the Virgin Mary. 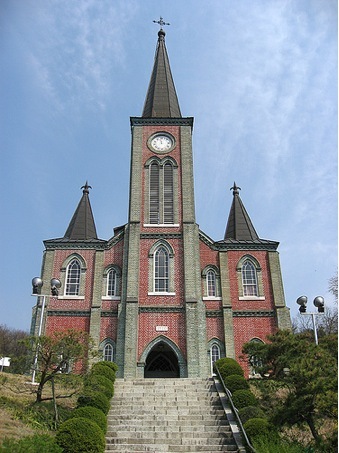 The current Gothic-style church—a miniature version of Myeongdong Cathedral—was built in 1930 (by Chinese laborers), and was designed by French priest Father Pierre Chizallet. I’ll say this—Bouillon couldn’t have chosen a better spot to put a church. The place gives off a very happy, loving vibe. 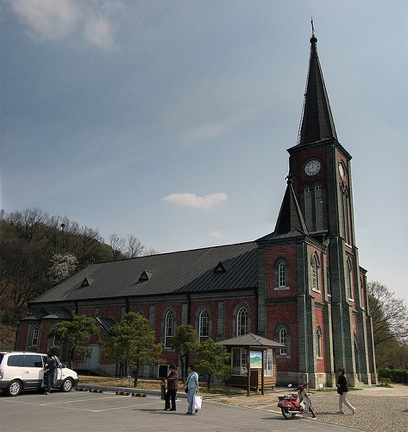 The church itself is absolutely beautiful—a red-and-black brick Gothic structure of the kind loved by French missionaries in Korea. It’s the surroundings, however, that make it what it is—how it looks out over the surrounding countryside, the beautiful trees that surround it, how you can feel the spring breeze. It’s just a very peaceful place. Next to the church is the former priests’ residence. A beautiful stone building built in 1934, the residence alone would be worth a designation by the local cultural property authorities. The outside has been perfectly preserved, although the inside has been extensively remodeled for use as a museum/office/lounge/chapel—with emphasis on the museum. The museum is worth looking at—the church has done a fine job preserving its history, and there’s a lot to see inside. 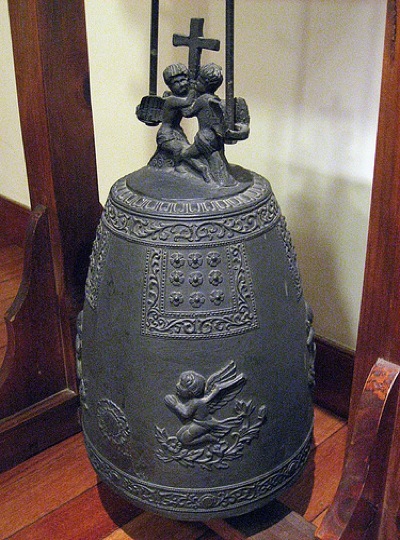 I don’t recall how old this bell is, but I did find it fitting that a Catholic church would possess a bell that, except for the cherubs and cross, could be found in the main hall of just about any Buddhist temple. 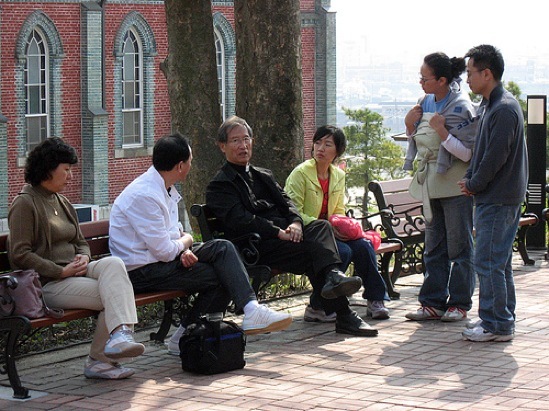 While Protestants and Buddhists have had a sometimes acrimonious relationship, Catholics and Buddhists have tended to get along much better. Part of this, I think, is due to shared history. 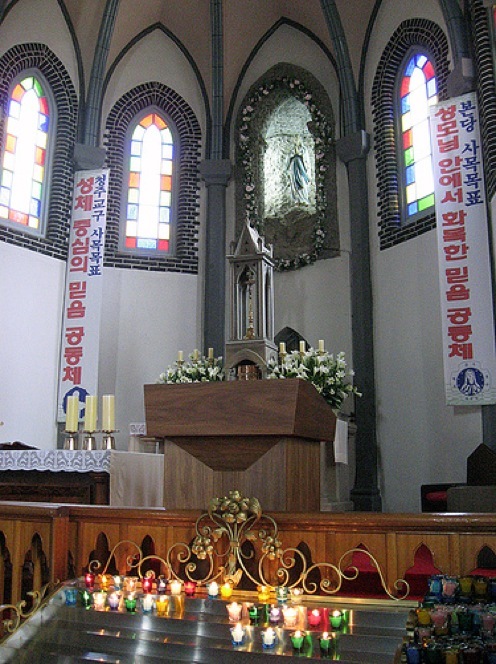 Unlike the Protestants, whose faith was introduced via Western missionaries (who often doubled as educators, diplomats and businessmen) who came to Korea legally in the closing years of the 19th century, Catholicism came to Korea much earlier, and as a result had a much rougher time of it. After its introduction in the 18th century, Catholicism was subject to several brutal persecutions—an eight year persecution that began in 1866, for instance, led to the deaths of some 8,000 Catholics. And Western Catholic missionaries weren’t immune—the 1866 persecution killed nine French Jesuits. 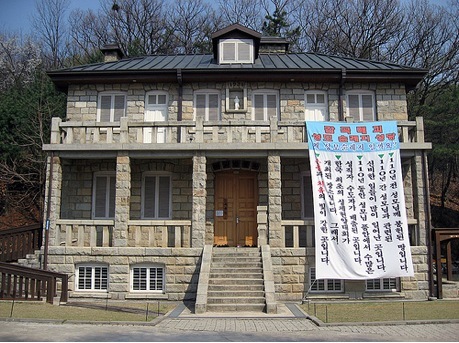 To avoid the persecutions, Catholics fled into the mountains where they were relatively safe, forming villages (such as the ones near Wonju) where they made a living farming or making earthenware jars. In this regard, their experience was not entirely dissimilar from that of the Buddhists—during the early Joseon era, Buddhists were virtually forced from the cities and into the mountains, and their faith subject to severe restrictions. Even though by the time Catholicism entered the scene, official persecution of Buddhism had eased considerably, I’m sure the Buddhists could at least empathize with the Catholics’ plight. 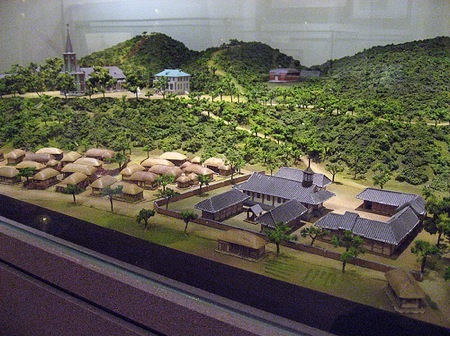 One of the early converts to the faith was silhak guru Dasan Jeong Yag-yong, whose lists of accomplishment include the design of Suwon Hwaseong Fortress. Anyway, back to the church. 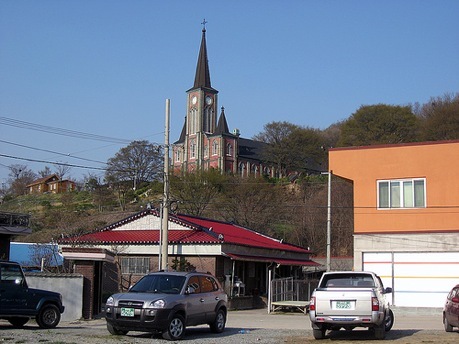 Originally, there were two churches—the Gothic one on the hill, and a Korean-style hanok one in the village below. A beautiful old photo of the two churches can be found here. This brings us back to our intrepid French priest, Father Camillus Bouillon. Born in 1869, Bouillon dedicated his life to the Virgin Mary, which shouldn’t be a surprise given how he was raised not far from Lourdes. 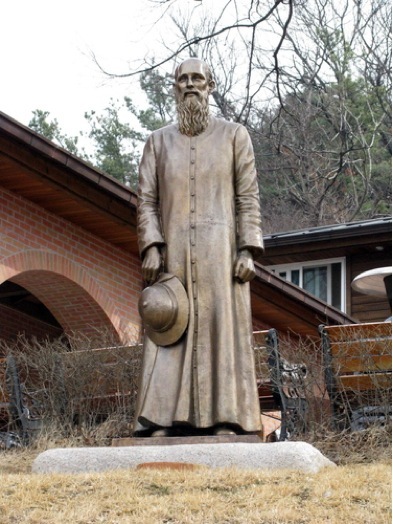 He came to Korea in 1893, immediately after entering the priesthood at the age of 33. He spend some 50 years in Korea—almost all of them in Gamgok, where he died in 1947. Oh, and he apparently had a thing for pith helmets. Which, of course, no white man should be without. Initially, he was buried on the hill in back of the church, but his remains have since been moved inside the church, near the altar. After his death, it appears the church struck up a relationship with the Maryknoll Fathers, with a number of American priests being sent to care for the flock. 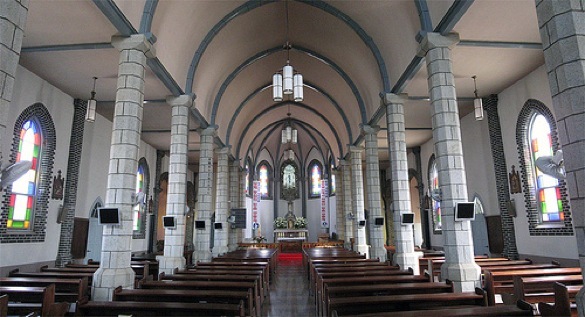 Like a lot of French-built churches constructed in Korea, the interior uses pointed barrel vaults (ooo, pointed barrel vaults) above the nave. On the other side of the church is a beautiful cloister adorned with the Stations of the Cross. The rock in the middle of the lawn, BTW, doesn’t have any particular meaning—it just looks nice. As you can see, the place is a nice place to relax and shoot the breeze. The priest in the picture (Fr. Anthony Jun, Pastor), coincidentally, speaks fluent French, having spent many years in France. And since everybody loves a pointed arch, here’s the view from the church entryway, out towards Gamgok. There’s a walking path up the hill in back of the church (there’s a large cross at the summit), lined at first with the 15 Mysteries of the Rosary, soon to be followed by the Stations of the Cross. About halfway up there is a flat grassy area with a flight of states leading to a statue of the Virgin Mary. In 1943, the Japanese tried to build a Shinto shrine on the spot. After the Japanese cleared the site, Bouillon secretly buried there a coin with the Virgin Mary and prayed, “If you make the Japanese construction stop, I will dedicate this place to the Virgin Mary.” As it would turn out, the weather would force construction to a halt, and attempts to restart would be frustrated for the next two years. Starting in 1955, a procession from the church to the site is held on the first Thursday of October—this is probably the best time to visit (anytime is good, actually—the church is an official pilgrimage site, after all).